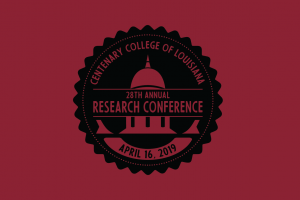 SHREVEPORT, LA — Centenary’s annual research conference, scheduled this year for Tuesday, April 16, has been a spring community event for nearly 30 years. A new format for 2019 aims to expand the reach of this academic conference designed to encourage intellectual collaboration and feedback. All sessions of the research conference are free and open to the public. All regularly scheduled classes will be suspended on April 16 so that the entire campus community can fully participate in the research conference, either as presenters or audience members. The 2019 conference includes traditional oral presentation and poster sessions in the humanities, social sciences, and natural sciences as well as visual and performing arts presentations. All first-year students enrolled in Centenary’s Trek 116 Challenge course will also present group research conducted as part of their course, the second in a two-semester sequence designed to introduce the foundations of a liberal arts education and cultivate intellectual curiosity, critical inquiry, thoughtful communication, problem solving, and respectful engagement with others. The Trek presentations kick off the research conference at 8:30 a.m. on April 16 and the schedule stretches throughout the day, culminating with the visual and performing arts sessions from 7:30 to 9:00 p.m. More information about the research conference and a full program will be posted at centenary.edu/researchforum. The 2019 Research Conference is sponsored by the Douglas F. and Marion S. Attaway Foundation and is made possible with the support of Centenary’s Convocation Committee, the Office of the Provost, the Student Government Association, and the Campus Activities Board. conference was organized by Dr. Scott Chirhart (Biology), Dr. Jeanne Hamming (English), Dr. Cory Wikan (Music), and Logan Sledge (Theatre).